When you are plagued by dull patchy skin and other hyperpigmentation issues, protecting yourself from the sun, using good skin care products including sunscreens, etc can help. However, you should also use a good product specifically designed to deal with pigmentation, that contains ingredients like Azelaic Acid, Kojic Acid, Phytic Acid etc. There are many ingredients listed in skin care products like kojic acid, salicylic acid, phytic acid, etc. You may wonder about the presence of so many “acids” in skin care products. However, these are all compounds beneficial to skin health. In pigmentation lightening products, Azelaic Acid and Phytic Acid are prominent ingredients, because they block melanin production. Melanin is the pigment that gives our skin its color and also protects us from harmful sun rays. Still, excess melanin results in dark spots, melasma, dark patches and other such skin blemishes. Skin whitening / fairness enhancing products make use of compounds that reduce melanin production. Azelaic Acid and Phytic Acid are two such skin lightening agents. Most of these work by inhibiting the activities of an enzyme called Tyrosinase that plays an important role in Melanin synthesis. Hydroquinone is a compound that has long been used as a whitening agent in skin care products. However, it is very strong and can only be used in small 2% concentrations. It can cause adverse reactions in people with sensitive skins. The search for milder alternatives has led to the use of compounds like Azelaic Acid, Kojic Acid etc. in skin whitening cosmetics. Azelaic Acid is a plant compound present in cereal grains like Rice, Wheat and Barley. Skin whitening compounds like Azelaic Acid work by hindering the role Tyrosinase plays in Melanin production. As melanin level comes under control, skin discoloration disappears. Azelaic Acid also has another beneficial effect, it is a good antibacterial. It has been US FDA-approved for use in acne treatment products. So, Azelaic Acid helps prevent or treat acne and also can help in reducing post acne blemish. Phytic Acid is an antioxidant present in fruit and cereal seeds. It has received a lot of bad press because it affects the body’s ability to absorb minerals like copper, iron, and zinc. This same property also make it a good ingredient to use in topical applications for skin whitening. Phytic Acid reduces melanin level by the simple act of denying entrance to iron and copper, ingredients vital for the production of Melanin. When combined with other compounds like glycolic acid, phytic acid is also very effective in treating Melasma patches. Melasma are patches of dark skin in the face, caused by a melanin surge triggered by hormonal fluctuation. There are other compounds used in skin whitening products, like Kojic Acid, Arbutin and Licorice Extracts, which are also mild botanical actives effective in helping to reduce pigmentation. 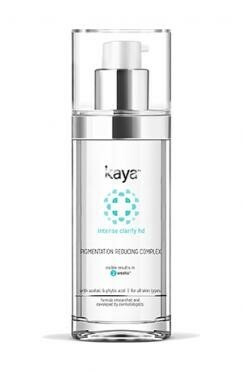 Kaya Clinic offers many products and services for dealing with pigmentation issues. One of the products is the Pigmentation reducing cream that comes in a pump bottle. It contains Azelaic Acid, Phytic, Acid and Kojic Acid among other ingredients to control melanin production and hyperpigmentation. It has a light creamy texture and the cream is easy to spread over the skin. It also gets quickly absorbed into the skin. Azelaic Acid and Phytic Acid, while controlling melanin levels, also help in skin lightening and fading away dark spots. They also help in preventing new dark patches as they bring down melanin production. Regular use can provide visible results within two weeks, in the form of disappearing dark spots and lighter tones in existing dark patches. Designed by dermatologists and clinically tested, this product is effective in gradually fading away sun spots, dark patches, and other pigmentation issues, helping you to get an even complexion free of marks and patches.